Think your area is too cold for avocados? Maybe not. You won’t find these avocado varieties in a supermarket. These are two of the high-oil-content, cold-hardy Mexican varieties whose skin is so thin you can eat them like an apple. They can grow in areas with winter freezes too cold for commercially grown avocado varieties to survive. Very rare – if you want these, you pretty much have to grow them yourself. On the left is ‘Del Rio’, on the right is ‘Wilma’. The high oil content of these Mexican varieties gives them a rich flavor, outstanding for guacamole. A group of little-known varieties of avocado can withstand freezing temperatures that would kill trees of the commercially grown types. These varieties offer the potential to extend avocado cultivation into areas previously considered too cold for this crop. If your winter lows don’t dip below about 15F (-9C), you might be able to grow these select forms of this delicious fruit. This article is based largely on experiences we’ve had growing these varieties in North Florida, where summers are rainy, humid, and hot, while winters feature periodic episodes of sub-freezing temperatures. If your summers are drier or cooler than ours, some of these varieties may perform better for you than they have for us. I will continue to expand and update this article as I gain information and experience with these varieties. Commercially grown avocados fall into two subspecies of this fruit: On the left is the Guatemalan subspecies, which has small fruits, bumpy skin, and a high oil content. On the right is the West Indies subspecies, which has large, smooth-skinned fruits, with a lower oil content flesh. The cold-hardy types belong to a third group, the Mexican subspecies, which is not grown commercially to any large extent. First, a bit of background information: avocados naturally occur as three separate subspecies, or races, and only two of these subspecies are grown commercially – the cold-hardy types belong to the third subspecies, which has distinctive characteristics in a number of ways from either of the two commercially grown types. The first commercially-grown subspecies is called the West Indies race: these are the large, green to red colored, smooth-skinned avocadoes that are grown in lowland tropical and near-tropical climates worldwide, including South Florida. West Indies avocado types have lower oil content, making their flavor less rich than the other subspecies. The West Indies group is the least cold-tolerant – trees can only take frost to about 28-30F (-1 to -2C) before geting heavily damaged. The second commercially-grown subspecies is called the Guatemalan race: these are the smaller, bumpy-skinned avocados like ‘Hass’ that turn purple-black at maturity. Guatemalan types have a high oil content, giving them an especially rich flavor. The trees are slightly more cold-tolerant than West Indies varieties of avocados, handling frost to about 25F (-4C). Cold-hardy varieties belong to the little-known third subspecies of avocados: the Mexican group of varieties, grown mainly in home gardens at this point. Here are a couple of ripening fruits of Mexican cold-hardy avocado variety ‘May’. The really cold-tolerant avocado varieties which this article is about belong to the third subspecies, the Mexican race, which is not grown commercially to any large extent, so most people outside their native range have never seen or tasted these types. Native to the northern Mexican highlands, these avocado varieties have small to medium sized fruits, smooth skin, and a high oil content that gives them an extremely rich flavor, with some distinctive flavor notes not found in other varieties. Most Mexican variety avocados can handle winter cold snaps down to around 18F (-8C). The most cold-tolerant can handle freezes of about 15F (-9C) with little damage, and still produce a crop of fruit the next year. A characteristic that makes it easy to identify Mexican-subspecies avocado trees even when they don’t have fruit is that the leaves smell like anise or licorice when broken open. So if you’re looking at an avocado tree in the landscape or for sale in a nursery, trying to figure if it’s really one of the cold-hardy Mexican types, just crush a piece of leaf and sniff. The skin of Mexican variety avocados is thin like an apple skin, so you can eat these types skin and all, or make guacamole by mashing up flesh and skin together, without needing to peel them. Some Mexican avocado varieties stay green-skinned as the fruit ripens; in other types the skin turns a rich black color at maturity (the flesh is still avocado-green even in the black-skinned types). This characteristic is handy because it lets you know when the fruits are mature enough to be able to ripen well off the tree – once a fruit has turned black, it’s ready to be picked. With the avocado varieties that stay green-skinned even at maturity, it can sometimes be a bit of a guessing game as to which fruits are at the peak of maturity. One thing I’ve noticed which might be a general pattern: the black-skin varieties of these avocados seem to have a distinctive, pleasant “creaminess” to the flesh, which reminds me a tiny bit of the texture of mayonnaise. I haven’t noticed any of the green-skinned types have this characteristic, but varieties ‘May’, ‘Gloria’, and ‘Brogden’, all of them black-skinned types, have the creamy texture. And a couple of as-yet-unnamed seedling varieties with black skins have that same creaminess to their flesh. The only black-skinned variety which does not seem to have it is ‘Wilma’, but I’m not sure that any of our ‘Wilma’ fruits are ripening properly here, due to that variety’s susceptibility to anthracnose in our humid climate. It may be that the “creamy” gene is located right next to the “black-skin-at-maturity” gene on one of these plants’ chromosomes, so those traits usually get inherited together. ‘Opal’ cold-hardy avocados have excellent flavor, and a good flesh-to-seed ratio. Medium sized, pear-shaped fruits, about 7 oz (200 g) that stay green at maturity. This variety was selected in Texas, where it has long been named either ‘Opal’ or ‘Opal Holland’. At some point a large commercial nursery started propagating this variety and gave it their own name: ‘Lila’. This variety has some of the largest fruits of any of the Mexican types we grow here in North Florida, with good size, flavor, and seed-to-flesh ratio. Fruits are somewhat susceptible to anthracnose in this area, which causes sunken black spots on the fruits that need to be cut out before serving. Fruiting season for ‘Opal’ in North Florida is July to September. The fruits of ‘Del Rio’ cold-hardy avocado may be smaller than those of some other avocado varieties, but they have an extremely high oil content that gives them probably the richest flavor of any avocado variety I’ve eaten. And the trees seem to be the most cold-hardy of this extremely cold-hardy group. ‘Del Rio’ has smaller, rounded to pear-shaped fruits that stay green at maturity. Fruit size is three to four ounces (80-110 grams). All the Mexican breeds of avocado have a high oil content and rich flavor, but ‘Del Rio’ seems to have the highest oil content and richest flavor of the bunch. This is really a fantastic flavored avocado, probably my favorite of all in terms of flavor. It makes an extraordinary guacamole. Because the fruits are smallish, it takes two or three ‘Del Rio’ fruits to equal the amount of flesh in one ‘Hass’. ‘Del Rio’ seems to be the most cold-tolerant of any of these varieties – we’ve seen trees of this cultivar handle freezes of about 15F (-9C) with little damage, and they still produced a crop of fruit the next year. The original tree is located in Del Rio, Texas, where it reportedly survived a freeze during the 1980s of 7F (-14C) that killed it back to major limbs, but the tree did not freeze all the way to the ground, and it re-sprouted and grew back into a large fruiting tree. ‘Del Rio’ trees have a particularly upright growth habit, and can grow into very tall trees, which can make fruit harvesting a challenge. Regular pruning to maintain height can keep the fruits within easy reach for harvesting. Fruiting season is July through October around here in North Florida. While all the other Mexican-variety avocados have leaves that are scented strongly of anise, ‘Del Rio’ is distinctive in that its leaves have only a faint hint of this aroma. My friend Oliver Moore and I may have been the first to grow this variety in Florida. In 1998, we got scion wood of this one from nurseryman Bill Schneider in Texas, who has a nursery, Devine Avocados, specializing in cold-hardy avocado varieties. Bill had collected this variety from the original tree in the town of Del Rio, Texas. At that time, Bill labelled the variety ‘Del Rio Big’ – in which the word ‘Big’ refers to the size of the original tree (which apparently was huge), not the size of the fruits. Once Oliver and I got plants of this one to ripen fruit a couple of years later, we realized this is actually one of the smaller-fruited varieties (though well worth growing because of its cold-hardiness and outstanding flavor). Because of the possibility of confusion – people could think “Big” refers to the fruit size, when this is actually a smaller-fruited type, Oliver and I decided to drop that word and just refer to this variety as ‘Del Rio’, and for many years that’s what we’ve called it. Recently I heard that Bill subsequently decided to distribute this variety under the trademarked name, ‘Pryor’. If you’re looking for a nursery selling ‘Del Rio’, getting ‘Pryor’ from Bill’s nursery Devine Avocados should be the same variety. But there’s one caveat: I’ve seen numerous people online say that avocado variety ‘Fantastic’ is also the same as Bill’s variety ‘Pryor’. Recently I got some grafted plants labelled as variety ‘Fantastic’ from a reputable wholesale nursery here in Florida. The plants have not come into fruit yet, so I can’t comment on fruit characteristics, but I can say that these plants are definitely not the same as ‘Del Rio’. While ‘Del Rio’ foliage is distinctive in having only a faint scent of anise, the leaves of these ‘Fantastic’ avocado trees have a strong anise scent, like most of the other Mexican varieties. So I don’t know if variety ‘Fantastic’ is actually a different variety than ‘Pryor’/’Del Rio’, or if possibly there could be more than one variety being distributed under the avocado name ‘Fantastic’. ‘May’ cold-hardy avocado is one of the most promising that we’ve tried. Fruits ripen early, and flavor is excellent. ‘May’ fruits are medium-sized, 4-5 ounces (110-140g), oval to pear-shaped, turn black at maturity, and have excellent flavor. Occasionally, ‘May’ fruits develop cracking at the base of the fruit, which can cause uneven ripening – the bottom of the fruit gets ripe and soft while the top is still firm. That might be related to the conditions of extreme humidity in our area (North Florida). Fruiting season for ‘May’ here is July to September. ‘Wilma’ cold-hardy avocado fruits weigh up to six ounces (182g). Like all the Mexican avos, it has a thin skin you can eat like an apple, and a high-oil-content flesh that has a rich taste similar to ‘Hass’, but with its own distinctive flavor notes. Great for guacamole, or just eating out of hand with a dash of salt. ‘Wilma’ fruits have a distinctive long, skinny shape, including a long, skinny seed. The skin turns black at maturity. ‘Wilma’ has long, skinny fruits that turn black at maturity. Trees of this variety grow well here in North Florida and sets lots of fruit, but the fruits seem particularly susceptible to anthracnose, which makes most of the fruits drop off prior to maturity. ‘Wilma’ might be better suited to climates with drier, less humid summers than we experience here in North Florida. We do get some fruits of this type to ripen here, and they are rich and tasty. Like other Mexican types, the tree’s leaves smell like licorice. People have grown this variety locally in Texas for many years under the name ‘Wilma’, but in the last decade a big nursery started propagating this type and selling the trees to big-box stores under their own trademarked name, ‘Brazos Belle,’ so you can sometimes find it under that name – but it is ‘Wilma’. Unlike most other Mexican varieties, in ‘Wilma’ fruits the seed tends to be loose inside the fruit, so if you shake the fruits you can hear the seed rattling inside. Fruiting season for ‘Wilma’ is September. ‘Gloria’ cold-hardy avocado is very early-season, starting to ripen fruits in mid June. ‘Gloria’ is a new avocado variety my friend Oliver grew from a seedling of a ‘Gainesville’ tree growing in the vicinity of a ‘May’ tree. Since ‘Gainesville’ has green fruits, while ‘May’ has black-skinned fruits, and the seedling variety ‘Gloria’ has black-skinned fruits, this is apparently a cross between ‘Gainesville’ and ‘May’. Fruits are smallish, 3 ounces (84 grams), completely oval, and have good flavor. ‘Gloria’ is distinctive in being the earliest variety we know of here in North Florida, with fruits starting to ripen in mid-June. ‘Gainesville’ avocado. This variety gained fame by being in a prominent location on the campus of the University of Florida in Gainesville for decades. ‘Brogden’ cold-hardy avocados are a hybrid between Mexican and West Indies types. They are mid-range in cold-hardiness between the pure Mexican varieties and commercial types, and they have a phenomenal flavor and texture. ‘Brogden’ avocados have a smooth-as-silk flesh unlike other avocados, and a high oil content that gives them the rich flavor characteristic of Mexican and Guatemalan varieties. ‘Brogden’ is an avocado-lover’s avocado. While the other avo varieties I’ve been profiling here are pure Mexican subspecies, ‘Brogden’ is a cross between Mexican and West Indies types. So the skin on this one is a little thicker than the skin on pure Mexican varieties, and the tree can take a hard freeze, but not quite as much cold as the pure Mexi-cados like ‘Del Rio’. But Brogden fruits get larger than the pure Mexican types, up to at least 10 ounces (280g). This variety seems like an extremely promising market fruit both for existing avocado-growing territory, and also for areas slightly too cold to grow commercial avocados. I haven’t grown or sampled the fruits of ‘Winter Mexican’, so can’t say much about it, except that it is not of pure Mexican subspecies parentage: it’s a hybrid between the Mexican and West Indies types. So it does not have the full cold hardiness of the Mexican cultivars. If your area is subject to winter lows that dip down to 20F (-7C) or colder, you really want the cold hardiness of the pure Mexican subspecies. ‘Winter Mexican’ has gotten distributed in the nursery trade and sold in the Gainesville (North Florida) area. I’ve spoken to more than one person around here who said, “I planted one of those supposedly cold-hardy Mexican avocado trees, and it froze!” In each case, it turned out that what they had planted was ‘Winter Mexican’. In North Florida and similar climate zones, nurseries should be selling avocado varieties that have pure Mexican parentage – a glance at this page will show there’s lots to choose from. A quirk we’ve found about the Mexican varieties is that here in North Florida, they seem to require shade from direct mid-day sunlight while they are young trees. Planted out in full sun, young trees sometimes struggle to gain size, staying only a few feet tall for many years. Planted in partial shade, the same variety can grow rapidly, reaching fruiting size of 15 feet (five meters) just two years after planting. Once the avocado tree reaches this size, it can handle full, all-day sunlight. “Del Rio’ fruits on the tree. Planting Mexican subspecies avocado trees can enable people to produce large quantities of home-grown avocados in regions with winters too cold for commercial avocado varieties. One way we’ve found to provide this light shade is to plant a guanacaste tree (Enterolobium contortisiliquum) a few feet south of a newly planted avocado. 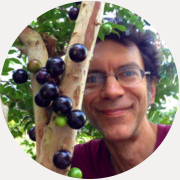 The enterolobium grows rapidly providing just the kind of light shade to the avocado tree the avo needs to make rapid growth (and also the guanacaste fixes nitrogen, helping to fertilize the young fruit tree). 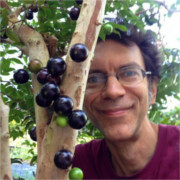 Once the avocado tree reaches fruiting size, it’s important to either remove the guanacaste tree altogether, or start regularly cutting it back. Enterolobium trees can grow to a huge size very quickly in Florida, overpowering the avocado tree. Like all avocados, the Mexican types are intolerant of flooding. We’ve seen even established, mature trees get killed by standing water around their base for many days. This happened after hurricanes Frances and Jeanne in 2004, and again with hurricane Irma in 2017. Choose planting locations that are not prone to flooding, or plant on mounds. If an avocado tree does experience flooding, that causes root die-back. Sometimes immediate heavy pruning to reduce the foliage can save the tree. The different varieties have overlapping ripening seasons, with ‘May’ being the earliest, ‘Del Rio’ the latest. Not all the fruits on one tree develop on the same schedule, so at any given time, some fruits might be ready to harvest, while some need more time on the tree. This requires a bit of judgement when picking, complicating growing these commercially. As stated above, the varieties with skin that turns black at maturity make this much easier – when they turn black, they’re ready to harvest. For each variety, there’s a period of a month or more when it’s possible to pick fruits off the tree firm, and those fruits will then soften and ripen in about three days. If left on the tree, fruits will eventually soften and drop off the tree on their own. Like other types of avocados, varieties of the Mexican subspecies are either “A” or “B” types for pollination. “A” types are female in the morning, and male in the afternoon. “B” types are male in the morning, and female in the afternoon. For best pollination, plant both “A” and “B” varieties, although in many trees, there is some overlap between the male and female periods, and the trees can self-pollinate to some extent. I will try to determine whether each variety listed here is either “A” or “B” and add that to the listings over time. Mexican type avocado trees can make fruits in as little as two years after planting, but fruit quality is sometimes inferior the first couple of years a tree makes fruit, reaching the full quality for that variety by about the third year of fruiting for that tree. Planting seeds from trees growing in mixed plantings of good varieties of cold-hardy Mexican avocados can result in good new varieties. This is an as-yet-unnamed new seedling variety. Mexican variety avocado cultivars can be propagated by grafting onto seedlings of any type of avocado. West Indies rootstocks are particularly vigorous, but because they are cold-sensitive, in areas prone to frost trees should be grafted low and planted out in the ground with the graft union buried. Bill Schneider in Texas has found that West Indies types are more tolerant of the saline soils in his area, so he grafts Mexican varieties onto this rootstock. Grafting onto Mexican seedlings has the advantage that the root stock is probably of similar frost-tolerance to the scion, reducing the chances of a cold winter freezing out the root stock. It’s also possible to produce own-root Mexican variety avocados by cuttings and air-layers. Both of these methods are slow, taking many months to produce roots. Planting out seedlings is also a viable option. We’ve seen seedlings start fruiting once they reach a height of about twelve feet, and seedlings from trees in mixed plantings of good-fruiting cold-hardy varieties tend to make good quality fruit and have similar cold tolerance to the parent trees. I am not recommending any of these Mexican varieties for large-scale commercial planting in the Southeastern US at this time. They’re not ready for that. What they are ready for is planting out as home yard trees, and small-scale experimental plantings by small farms as part of a diverse crop assemblage for local sale in farmers markets. Additionally, we need to develop markets for these varieties. Shipping is challenging, with the thin skin and brief window of time after picking before they start to soften. But they could be sold for a premium price based on their special qualities: extremely rich flavor, unique flavor and texture, and the fact that you can eat them skin and all.